This just in from the Guardian this evening answers a question I've been wondering about for weeks (and, yes, I'm sorry...it's more on Enid Blyton.) Beginning with the first 10 Famous Five books, Blyton's language is being revised in an attempt to give the books greater appeal to today's children. Such phrases as "mercy me" and "awful swotter are being replaced with a more contemporary version (such as "oh no" and "bookworm" respectively) The idea is to make Blyton's novels timeless and to open the opportunity for children to relate to characters and relationships through dialogue. "Children who read [the Famous Five books] need to be able to easily understand the characterisations and easily to get into the plots. If the text is revised [they're] more likely to be able to engage with them. ", as Anne McNeil, publishing director of Hodder Children's Books explains. There will be no references to mobile phones, text speak or modren slang. Hodder is "senstively and carefully" revising the language after research with children and their parents showed that the dated original text was preventing young readers from a full enjoyment of the stories. I wonder how Enid would feel? Absolutely wonderful! Cave Baby is a perfect collaboration bewteen Julia Donaldson's storytelling skills and Emily Gravett's timeless illustrations. I just love it! And to celebrate the release of this beautiful new picture book, Dubray Books has an amazing colouring competition. It's the chance for eight lucky young fans of Donaldson and Gravett to win a signed limited edition print from Cave Baby, plus an amazing selection of other books! The competition is also a brilliant chance to show off your own illustration skills. It seems that Cave Baby has a blank wall in his cave. How would you help him to fill it? Pick up the competition forms in any of the Dubray Books shops, or download it directly from the Cave Baby tab on their Facebook page. Entries must be in by 23rd August; winners notified on 27th August. And as if that weren't enough, there is a Cave Baby site....CaveBaby.co.uk. It's not quite ready yet, but if you keep your eyes on Emily Gravett's (fantastic) website, there will be a direct feed to Cave Baby. 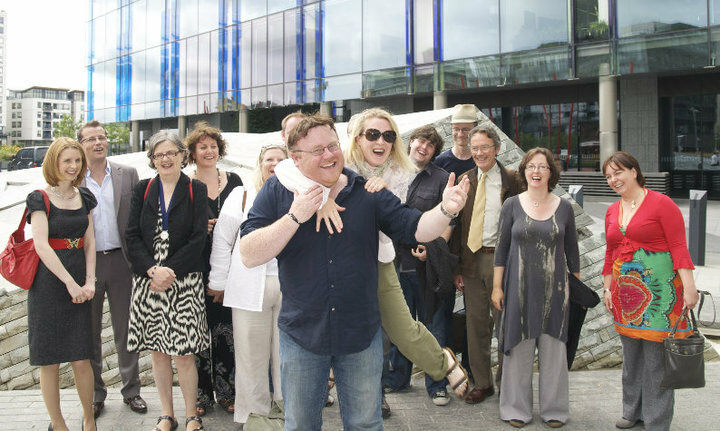 Dublin Now Designated UNESCO City of Literature! Absolutely wonderful news! UNESCO has now honoured Dublin by designating it as the fourth City of Literature within it's UNESCO Creative Cities Network. Dublin has received warm welcomes from the other three designated cities; Edinburgh , Melbourne and Iowa City. Fabulous recognition for all our illustrious writers! Congratulations Dublin!!!! "Normally, it wouldn't be anything I would consider doing, because I need to write freely and if I tried to mimic someone else, I think I'd write a bad book........But the idea was so good, I started getting my own ideas about how I would write the story." I also have it on good authority that this is Eoin Colfer week, with live streaming today (see earlier blog posts) and appearances by the very busy Mr. Colfer for signings and readings...in Dublin, I hear. Children's Books Ireland has just unveiled this year's Bookfest poster. Every year, CBI invites an incredibly talented illustrator to design the poster for the annual event, and this year the commission went to Kevin Waldron. Kevin has already made his mark on the illustration world with a picture book version of the Edward Lear poem 'The Owl and the Pussycat' and his first title, Mr. Peek at the Zoo (2009, Templar). His next project is a collaboration with the truly magnificent Michael Rosen to be published this autumn by Walker Books..... and the Bookfest poster is absolute class! 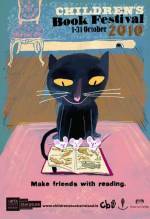 The Children's Book Festival takes place all over Ireland every October. I know, I know, I should have posted this ages ago.....but if you haven't done this already, you really must check out Celine Kiernan's blog about all things Moorehawke. Her incredible Moorehawke trilogy will find it's completion with the (much awaited) publication this October of 'The Rebel Prince'. That will give you just about enough time to read 'The Poison Throne' and 'The Crowded Shadows' if you haven't already (What....you haven't???!!!!! Why not? ); check out the blog thoroughly and get yourself up to speed for what promises to be one of the most exciting conclusions ever! This is absolutely brilliant news! Booktrust has announced a new pilot partnership between Letterbox Club and the Siobhan Dowd Trust. The Letterbox Club was formed in 2007 to improve the eductaional opportunities and outlook of looked after children between the ages of 7 and 11 years old. In receiving funding from the Siobhan Dowd Trust they are now piloting the Letterbox Club Green for 60 looked after children across the UK between 11 and 13 years. The children will receive a parcel of books, maths games and stationary supplies. The bright green packages are sent directly to the children. "Booktrust is thrilled that Letterbox Club, now in it's third year, continues to thrive. To have been awarded funding from the Siobhan Dowd Trust at this point gives us enormous scope to develop parcels for older children and is a huge endorsement of the programme." The Siobhan Dowd Trust was formed in 2007, just a few short months before her death at the age of 47. It was Siobhan's intent to leave this legacy to support disadvantaged young readers. Let's have many more initiatives like this please. There is a brilliant editorial by the fantastic Dermot Bolger in the Irish Daily Mail, 15 July. 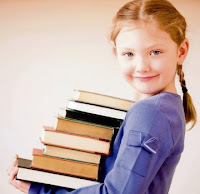 Entitled 'Why on earth are we denying our children the joy of reading books? ', Bolger recounts some of his early memories of books and discusses the role reading played in his life when, at the age of ten years, he lost his mother. "I needed an alternative imaginary world to survive. I needed to be swept along in adventure books and mysteries - texts that did not instruct me about rules of verbs or mathematics, but simply gave me imaginative freedom and a safe place where I could explore emotion." His following discussion then explores the importance of school libraries in the lives of young people, particularly those who would not have access to books or even the concept of reading for pleasure. Bolger's defence of the JCPS Demonstration Library Project (launched in 2001) is eloquent, indeed. "They allow students to learn about life, not through the necessary strictures of some curriculum or the relentless pressure of a points race, but through providing a safe haven where teenagers can stumble into other people's imaginations and find that they chime with their own." Dermot Bolger's new book for teenage readers is 'New Town Soul', published by the wonderful new imprint of New Island Press, Little Island. In this YouTube video, produced by Walker Books, the amazing Shirley Hughes talks about creating her new picture book 'The Christmas Eve Ghost' and about the art of creating picture books, in general. We have here a brief, but intimate glance at Shirley Hughes at work, and a rare opportunity to hear her comments. In regard to visual literacy and it's role in the development of reading, she says something so perfect about the importance of picture books that I'm quoting it here for you. 'The Christmas Eve Ghost' by Shirley Hughes will be available September 2010. Here's a great article from today's Irish Times encouraging summer reading for children. Throughout the school year, children are somewhat limited in their reading due to time constraints with classes and homework, etc. Summer is the perfect time for children's reading. The days are longer, they have loads of time and they aren't being directed as to what to read...children can make their own choices. And during the summer, reading is for pure enjoyment. So, I thoroughly agree......Pile Them High! Great encouragement and support can be found at your local library or bookshops where junior book clubs and story times are regularly held. Or, if you can find nothing local, why not encourage your children and their friends to create their own book clubs?... And perhaps best of all....just let them read. Great comments in the article (link below) by John Connolly, Joseph O'Connor, Siobhann Parkinson.. and CBI's own Mags Walsh. Which reminds me...if you want to keep up with what's current in children's literature in Ireland, check out Inis magazine, the quarterly publication of Children's Books Ireland. I had been under the impression that the 'Five Find-Outers' series was out of print and unavailable. A listener had texted (?) in to say they were available. So, while at work this morning I did a bit of research and this is my result. Yes, indeed the 'Five Find-Outers' are aavailable, but they are only referred to as the 'Mystery' series. Also, the 'Famous Five' series have gone into reprint, and the first 10 of them are out now with their new covers. The others are being published at the rate of about 2 per month until all 21 have been reissued. Okay, I'll stop now with the Enid Blyton talk. Promise. Here's the link for anyone who wants to listen online to the panel discussion I was involved in earlier this evening. I'm not sure about my contribution, but the panel was very interesting and brought some very valuable views in regards to Enid Blyton's life and work. Apparently, yours truly will be joining the panel (via my home phone) on NewsTalk 106-108fm at 7pm this evening for the 'Talking History' programme. The panel will be discussing the life of Enid Blyton and the continuing appeal of her books for children the world over. As Sarah Webb was unable to participate, she suggested that I join them in her absense. Fingers crossed for me. I'll let you all know how it works out. Let's not forget that voting for the 2010 'Queen of Teens' closes on 31st August. So please get your vote in as soon as possible. There is a stellar list of nominees, all very deserving, including Cathy Cassidy, Jacqueline Wilson and Ireland's own Sarah Webb. So, who'll be your 'Queen of Teens'? The Galway Arts Festival begins on Monday, 12th July, and one of the highlights for me will be the exhibition at the Galway City Museum, Henri Matisse: Drawing With Scissors. This will feature 35 original lithographic prints of Matisse's seminal papr-cuts which were produced during the last 4 years of his life, when the artist was largely confined to his bed. It will include many of his iconic images which have had incredible influence on art, design and children's book illustrations, such as The Snail and Tristesse du Roi. While adults seem happy to debate the content and context of this work, I've always found that children automatically get it! It's also a must for fans of Miffy and Maisy. And an absolute must for me. Truly a once in a lifetime opportunity!!! And it's free. 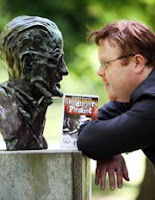 Derek Landy's Skulduggery Pleasant has beaten out some of the best selling books worldwide to become the Irish Book of the Decade! Open to all categories, Landy triumphed over such brilliant and noted Irish authors as Colm Toibin, John McGahern, Anne Enright, topping the list of fifty books. Open to all categories, it is fantastic to see the prestegious award won by a book written for young people. I echo Landy's sentiment when he said, "It shows a real respect for our next generation of readers..."
Congratulations to Derek and Skulduggery Pleasant! How incredible!!! Thought I'd like to mention, to celebrate the publication of the latest adventure of our own 'Penny The Pencil'...'Penny On Safari' by Eileen O'Hely (published by The Mercier Press in Cork), Dubray Books (Galway) is running what has now definitely become an annual event, the 'Penny The Pencil' colouring competition. You can pick up the colouring sheets in Dubray Books' Galway shop. Just do your most creative, best work, drop the entry back into the shop by 30th July with all your details filled out and a contact phone number on the back. You'll be in with achance to win a tin of 36, 24 or 12 Faber-Castell artist -grade coloured pencils. Entries will be judged by our own discerning staff members. For all fans of the irrepressible Moomins, there was a marvellous article in Saturday's family section of The Guardian. The Moomins turn 65 this year and their welfare is now in the clearly capable hands of Sophia Jansson, niece of their brilliant creator, author Tove Jansson. Sophia talks about the Moomins, their creation and the inspiration behind them, as well as the 'mixed blessing' of receiving such a rich inheritence and growing up in a family of artists, all with very strong personalities under unusual circumstances. It is down to Sophia now to protect the artisic integrity of the family firm Oy Moomin Characters. Puffin has been reissuing the Moomin books, now all out in print again, and with some new additions - picture books and board books for the very young in which the Moomins learn about colours, numbers, etc. I'm a huge fan of the Moomins, myself; and I'm delighted to report that this love has spread to my grandchildren. I'm also very grateful that they get to experience the Moomins as they were meant to be. Just Moomins. New Skulduggery Pleasant Is On It's Way!!!! 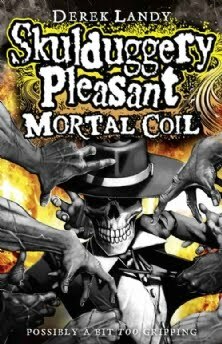 The latest installment of the brilliant Skulduggery Pleasant series by Derek Landy is on it's way! After 'Skulduggery Pleasant' (the original) sweeping the 'Irish Book of the Decade' award by taking in excess of 5000 online votes and beating out such strong contenders as: Joseph O'Connor, Sebastian Barry, Ann Enright... well there was a list of 50, the 5th book in this extremely popular series for young people, 'Skulduggery Pleasant: Mortal Coil' will be out on 2nd September! And, with Derek touring, my best bit of news (very excited!!!!) is that he will be hosted by none other than Dubray Books, Galway on 14th September for a book signing and to meet his loyal followers in the west of Ireland! (Yayyy!!!!) The event will be after school hours, so no need to worry. Watch this space for more information as it becomes available! Great news for all us 'Fowl' fans! The latest Artemis Fowl book (by the incredible Eoin Colfer, of course) will be launched on 20th July. To celebrate, Eoin Colfer is hosting a Virtually Live! even on the day at 2 - 2.45 BST. Registration is now being taken. Just click on to the link for more information.